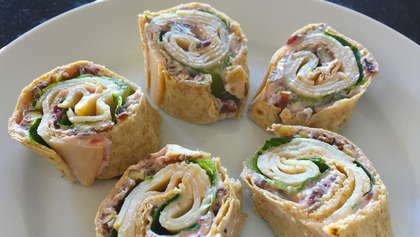 Turkey Cranberry Pinwheels have a touch of sweetness your kids will love. Spread cream cheese mixture on one side of tortilla. Roughly chop and sprinkle pecans over cream cheese. Place one large lettuce leaf in center of wrap over pecans. Distribute 3 slices deli turkey over lettuce. Roll and wrap securely in plastic wrap. Refrigerate for at least 30 minutes (or overnight).